Please shake well for 2 minutes before using (every time). 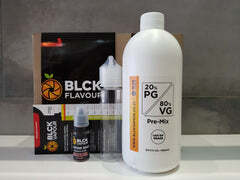 **The PG or VG is just the carrier for the nicotine, you will still need separate PG and VG to make your e-liquid mix. Warning. Concentrated nicotine is extremely dangerous. Please use gloves when working with nicotine & keep away from minors. If swallowed, seek medical attention immediately.